Jaama warns foreign forces, saying "we will think of steps to take against them"
NAIROBI, Kenya (CNN) -- One of the pirates who held a Saudi oil supertanker off Somalia before releasing it for ransom has told CNN how five in his group drowned when the boat in which they left the ship capsized as they tried to evade rival pirates seeking a cut of the money. A parachute floats down to the Sirius Star after being dropped by a small aircraft on Friday. Pirates seized the Sirius on November 15. A $3.5 million ransom payment -- down from the initial demand of $25 million -- was dropped by parachute onto the ship Friday, but the pirates delayed the vessel's release after the drownings. "Other pirates on the shore wanted a tip from the pirates on the Sirius Star, so they started to fire in the air as our people approached the land," Libaan Jaama told CNN. "When our pirates heard the shots, they thought they would be robbed, so they tried to return to the tanker. In that quick turn the boat capsized." 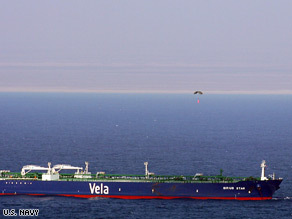 The supertanker, owned by Vela International Marine Ltd., a subsidiary of the Saudi Arabian-based Saudi Aramco, was the largest ship ever hijacked by pirates. The ship is a VLCC, or "very large crude carrier," and more than three times the tonnage of a U.S. Navy aircraft carrier, the U.S. 5th Fleet said. The tanker's capture in November sparked fears for its enormous cargo. The Liberian-flagged tanker was carrying 2 million barrels of crude oil worth about $100 million when it was captured. Andrew Mwangura of the Kenya Seafarers Association said it would have been a "disaster" if the pirates had fired guns aboard the ship, harming the cargo or igniting a fire. Hijackings off East Africa are a cause of growing international concern, spurring a number of international navies to patrol the pirate-wracked Gulf of Aden. The Gulf of Aden links the Indian Ocean and the Red Sea. About 20,000 oil tankers, freighters and merchant vessels pass along the crucial shipping route near the largely lawless Somalia each year. The financial and human costs of piracy are extensive. Ships ranging from luxury yachts to the Saudi supertanker have been held for ransom. At least one major company pulled its ships from the Gulf of Aden region in 2008, meaning cargo bound for Europe had to round the African continent rather than use the Suez Canal. The pirates are based in Somalia -- a land racked by poverty and conflict -- and say hijacking ships is all about the money and the lifestyle. "We have the best way of life," Jaama said. "We drive in white SUVs, we enjoy driving them and there is absolutely no difficulty in our life." Jaama warned the flotilla of coalition warships in the region ready and authorized to strike at Somali pirates to back off. "Those foreign forces are making a mistake targeting pirates because we only hunt in our waters," he said. "If they come to our borders, we will think of steps to take against them."